Not that it serves as an excuse, but the illustration above perfectly captures the mood that anticipated yesterday’s game. Corinthians’ usual suspects had been replaced by bench warmers, while most of Palmeiras’ key players were on the pitch in body but hardly in soul. The result: on one side young guns trying to get the world’s attention; on the other side eleven not very interested nor interesting football players. The young guns drew the longer straw in the end. Of course Palmeiras should’ve won against Corinthians’ B-side, and of course the three point would’ve been a good starting point for a recovery of the disastrous initial rounds of the Brasileirão (two point in six games now), in addition to boosting players’ self-esteem. But let’s be honest: no-one cares. The focus is completely on the 180 minutes that will decide this year’s Copa do Brasil. It’s been 14 years since Palmeiras last national title. 14 long years. 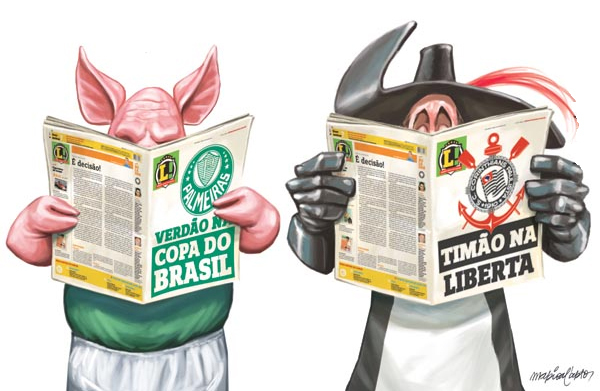 And without any aspirations in this year’s Brasileirão (except avoiding relegation, that is) the Brazil Cup is the only possibility to avoid complete fiasco and another year down the drain. It’s never been more “all or nothing” than this. Never. And God help any player wearing our jersey who doesn’t give his life for this title. Just now CBF confirmed the first leg of the finals for 5 July (not the 4th, as that would clash with the Corinthians vs. Boca Juniors Libertadores Cup final) and the Barueri stadium. So be it. The stadium is of difficult access and too small for the anticipated number of spectators, but that’s where Palmeiras’ players feel the most comfortable. As I opined in the previous post: the error was letting players get used to playing in Barueri in the first place. Made the bed, now sleep in it. You will have noticed the less critical tone in recent posts. Don’t be fooled into thinking that Palmeiras is doing any better in terms of administration or whatever; no sir, there are a LOT of unsaid things. But that will have to wait until after the finals. Your approach was more than perfect, Kristian. Nothing left to say, criticism doesn’t help now in any way, as you said, far from agreeing with the catastrophic situation on Brazilian chart or worse, terrible things that have been happened in our premises: adversary supporters celebrating enemy´s goals, the president asking for “suspicious” people (to say the least). Yeah, we have 180 minutes before drawing 2012′ line. 180 minutes of complete sacrifice. Complete. God, I’m anxious, terrified, on fire already. This can’t be good. Take care, Newton! Well…let´s just hope our focus bring us back the expected result! We need this cup…cause if we don´t have it, in last place it´s going to be the biggest crisis starter ever! Cesar, thanks for stopping by. And yes, we need it. I can’t even start to imagine the hurricane that will follow if we fail.